Did you know getting pulled over for Buzzed Driving could cost you $10,000 in legal fees, court costs, and increased insurance rates? As the excitement and hype of the Super Bowl gets into full swing, one thing that may not be on people’s minds is buzzed driving. However, over 10,000 people were killed in 2010 in alcohol-impaired vehicle crashes. A buzzed driving accident can happen to anyone, anywhere, no matter which team they are rooting for. 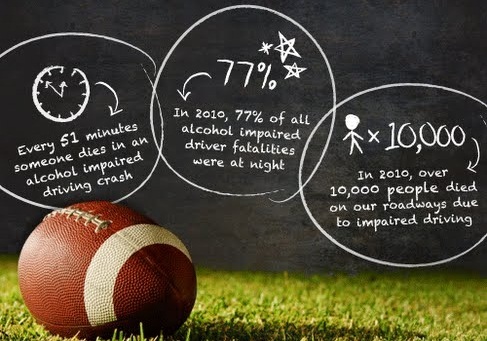 Help spread this message before the Super Bowl, a traditionally big day for celebrations with good food, good friends, and yes, alcoholic beverages, by posting about the dangers of buzzed driving. Your readers can find more information, get the latest updates and ask questions on the Buzzed Driving is Drunk Driving Twitter feed (@buzzeddriving) and on Facebook.